Please mark your diaries for Wednesday 29th March 2017. Joyce Meader of The Historic Knit is holding another open house event at her home in Hampshire, UK. Joyce is an expert on historical knitting and an historical and vintage hand knitter for film, television, museums and re-enactors. Her collection of original knitting patterns, books and knitted items from the nineteenth to twenty-first centuries is wide-ranging and full of interest. Joyce is also an entertaining and engaging speaker with a talent for making the past come alive. Last year saw the publication of her book ‘Knitskrieg! 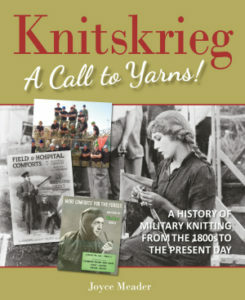 A Call To Yarns’, a history of military knitting drawing on Joyce’s collection and extensive expertise. For more details, please contact Joyce directly by emailing her via The Historic Knit website, on Ravelry or via Facebook. We will post an update with further information when we know more. The chance to hear Joyce Meader and see her extraordinary knitting collection close-up is a wonderful opportunity and well worth the trip to Hampshire!